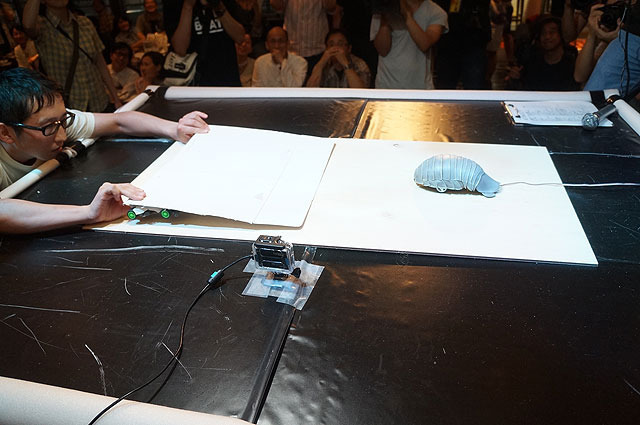 This is a robot sumo-wrestling competition. It is an arranged version of Japanese sumowrestling. - Plywood that is about 100cm x 50cm in size is to be the ring. - If a robot falls over, it loses. - The situations below are not counted as losses, and therefore the match is to continue. - Any part of the robot that is not in direct contact with the ground is sticking out of the ring. - Exception of [A] : In the case that one robot exits the ring without the two robots ever coming into contact, the match is considered a failure, and therefore a rematch is to be held. However, this rule is to be applied only up to two times per matchup. From the third time, this rule does not apply. - The time limit of each match is to be one minute. In the case a winner is not decided within the time limit, the robot that has travelled a shorter distance in the ring loses. - If it is difficult to judge the clear winner based on the above rules, then the final result is to be determined by the audience. - The matches are to be held according to the matchups as listed on the knock-out tournament chart. - One win earns a contestant ten points. - The high-tech penalty rule, as described in the following paragraph, is to be applied per match (six points are deducted per violation per match). The winner of the competition is the contestant who ends up with the most points. Ordinarily, the contestant who wins the knock-out tournament would be the winner, but in the case that winner had points deducted over the course of the competition, he may end up not being the winner of the competition. - The organizer of each Hebocon competition should have some prizes other than the championship ready for robots that are Heboi, which means "technically poor," or "poor in quality." Such prizes are much more honorable than the championship. Don’t get all caught up on winning, and just enjoy Hebocon. Please participate with a robot that satisfies all the conditions stated below. - It is not over 50cm across, nor 50cm long (no restrictions on its height), and weighs no more than a kilogram. In the case any of the following features on a robot have been achieved through the technical abilities of its creator, that creator is to be penalized for demonstrating overly high technical capabilities. - Automatic controls (controls triggered by information sent by sensors of any kind, measurement of passed time, or measurement of travelled distance, etc.). - Anything else the judges may consider as being high-tech. Note: The penalty is to be applied in each match that the high-tech feature concerned is enabled. The penalty is not to be applied in matches where that high-tech feature is not used. Note: The penalty is not to be applied in the case where there is a high-tech feature on a robot, but not achieved through the technical capabilities of its creator. Example : A machine consisting of a ready-made radio-controlled car and a bunny wrapped around it would not be subjected to the penalty, as the creator had nothing to do with the creation of the radio-controlled mechanism. Note: Even if a robot has high-tech features, if the implementation fails or if it does not work at all, it will not receive a penalty. Example : The robot is supposed to automatically pursue the opponent, but instead it just turns around in place. Note: Participants will be able to check in advance with the organizer of a particular Hebocon competition whether or not his robot would be considered as being high-tech by the judges. - The penalty deducts six points per high-tech feature per match. More points are deducted in the case a robot has multiple high-tech features. So, those are the rules. If you are planning on entering a Hebocon competition, please make sure you read the document titled "What is Hebocon." Hebocon is not about winning the championship. It is more important to enjoy Heboiness. Don’t worry about winning, and just praise each other’s Heboiness!